Today's post has a "bounce in its step" compared to Monday's complaint-fest. Hope it helps get you through hump day! Despite quite a few "downs" - flight delays, illnesses, self-imposed quarantines, plantar fasciitis, sleepless nights, uncooperative weather - our nearly two-week visit to Wisconsin had plenty of ups as well. Both of our flights on our way to Wisconsin were delayed. What's new, American Airlines? Will, who started to feel ill midday, kept falling asleep on the floor of the airport (and then on a window sill at breakfast the following morning) during one of our delays. Poor buddy. Thankfully, Will ended up with only a cold - though colds take Will down pretty quickly and for long periods of time because of his lung issues - and a mild ear infection. Hallie, on the other hand, felt right as rain and never stopped talking throughout the entire trip. She was excited about absolutely everything - flying to Grandma and Grandpa's house, seeing Lily and Carter, taking a break from homework and school, CHRISTMAS, sledding and ice skating, drinking cran-apple cocktail on the plane, recognizing words in the airline safety manual, sitting near a cat traveling with its owner in a little purse, eating goldfish and licorice for dinner - and thanks to the volume at which she expressed her enthusiasm, everyone around her knew so. Tom and I each asked her to "use her indoor voice" at least 25 times, and every single time she responded with an "oops! ", a promise to quiet down, and then a slow and steady climb back to Excitement Level 10. The following day we celebrated Lily's fourth birthday with a chocolate, Frozen-themed cake, presents, and a trip to the mall to get her ears pierced. 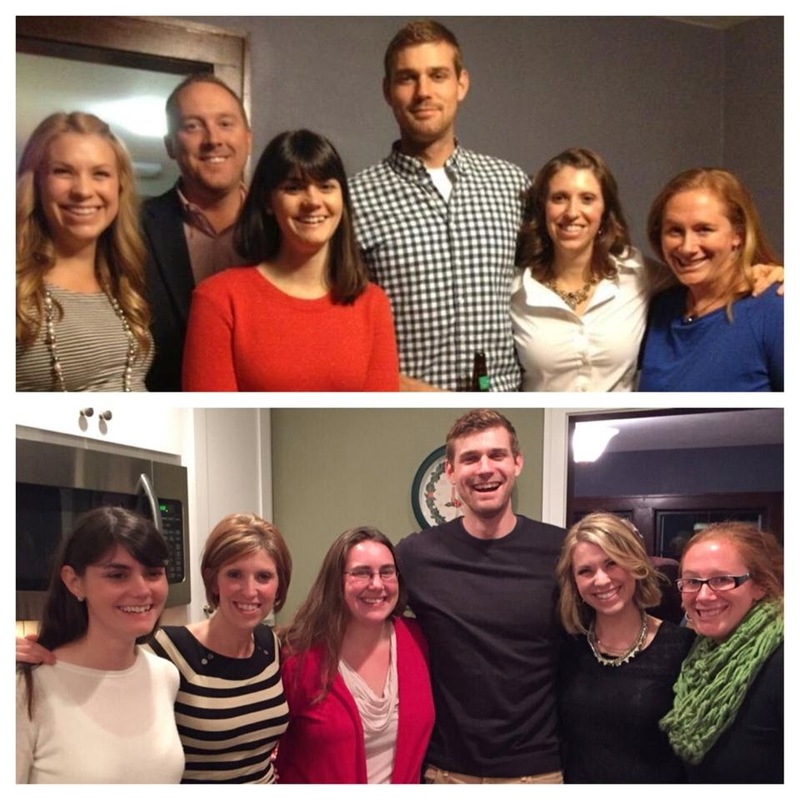 Hallie and I loved sharing in Lily's milestone event. My favorite moment during Lily's birthday celebration occurred when Lily unwrapped individually packaged Elsa and Anna dolls. When Lily gravitated toward Elsa, dropping Anna on the ground, Carter swooped in and grabbed Anna. He begged his daddy - by frantically signing "please" over and over again - to unwrap Anna, and then, as if he knew Anna was the only doll Lily would ever allow him to play with (and that as the younger sibling, he is "the Anna" in his family of four), he proudly adopted her as his own. Seriously, look at his face in the bottom two pictures below. We ventured out one evening to see a 300+ year old tree, situated on the University of Wisconsin campus, that the city plans to chop down shortly. I realize that visiting a tree sounds like a strange outing, but it ended up providing us with an opportunity to take (or for a stranger walking by to take) a few group pictures for my parents' Christmas card. My mom, sister, and I took the kids to see a fantastic train and Lego display at Olbrich Gardens. (Olbrich Gardens, otherwise known as the site of the now infamous butterfly "attack". We verified ahead of time that the train and Lego exhibit would be butterfly-free.) The grown-ups and Will appreciated the elaborate Lego villages, while the younger kids - especially Carter, who could not get enough - loved the train best of all. We held one of our regular jam sessions, with my dad and his best friend, Chuck, on guitars and vocals, Tom on the piano, and me and my sister on vocals. This year we added Will on drums, Carter on harmonica (which he was surprisingly good at), and Hallie and Lily on dancing. To me, this picture perfectly represents Christmas. Family members and friends, singing and dancing and making music by the light of the tree. Santa came! He brought Carter trains (to go on the train table my parents bought him) and a drum set, Will a soccer ball and new sneakers (per his request, Will received a "greenish-yellow and gray pair and an orange and blue pair"), and Hallie and Lily American Girl dolls dressed like Elsa. Santa also brought Anna outfits for the dolls, but the Elsa dresses have been worn considerably more frequently at this point. The following day, my friend Katy's mom found this picture. 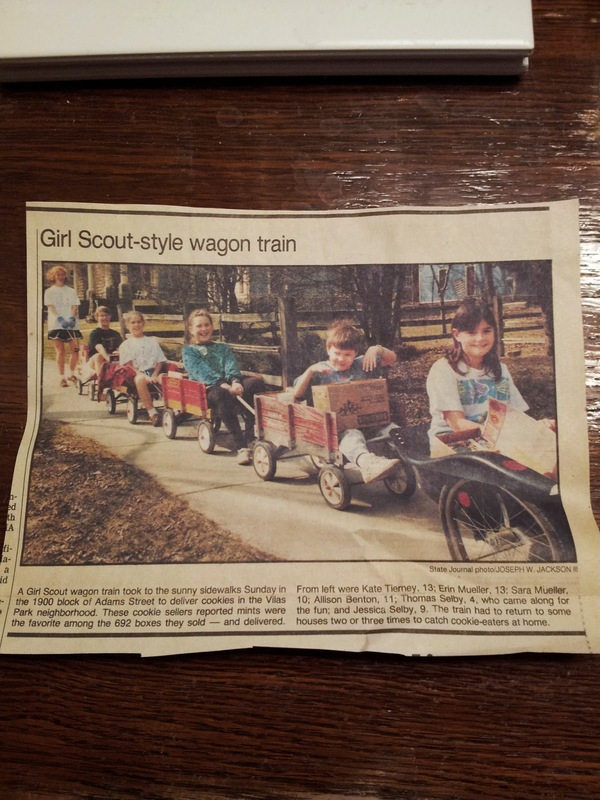 The six of us in the bottom picture above once delivered Girl Scout cookies in a wagon train and made it on the cover of the Wisconsin State Journal. The littlest kid in in the newspaper photo is now the biggest "kid" in the pictures above. My mom, sister, and I took a day trip to the outlet mall in Wisconsin Dells (to make up for the fact that we weren't able to travel to Chicago for our annual shopping weekend this year), and my dad reserved/rented out a local indoor soccer field so that all 10 of us could participate in what I imagine will now become a regular soccer extravaganza, but we didn't get any pictures of either of these two outings. Finally, a few miscellaneous pictures from the rest of the trip. playing outside when the temperature is 12 degrees. going to need a nice, long break from princess books. Opening one of their sets of matching pajamas on Christmas Eve. him - while tucking Hallie in one night. gym here in TX - while working out in Madison. Making Rice Krispie Treats (almost) all by herself. Will and Grandpa at the Badger basketball game. I hope y'all had a wonderful holiday, and that the transition back to "real life" hasn't been too tough!